Valentine’s Day Gift Certificate Sale!!! You can purchase online at www.sheilahebert.com/payments. Just click on the “buy now” link, enter the amount of $100 (and YES, you can buy more than one) and type “Valentine’s Day” in the description, then proceed with your payment method of choice. 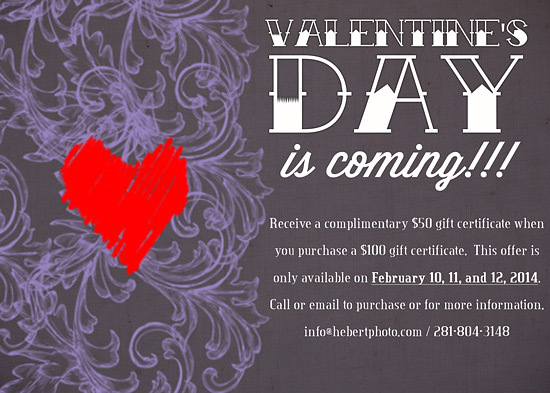 And of course, if you have any problems just give me a call at 281-804-3148 or email at info@hebertphoto.com Your gift certificates can be picked up the week of February 10th or they can be sent via email.